View on Nagasaki Harbor and the foreign settlement in Oura and Higashiyamate in Nagasaki, Japan. On the right is the Belle Vue Hotel, located where the Tokyu Hotel now stands. 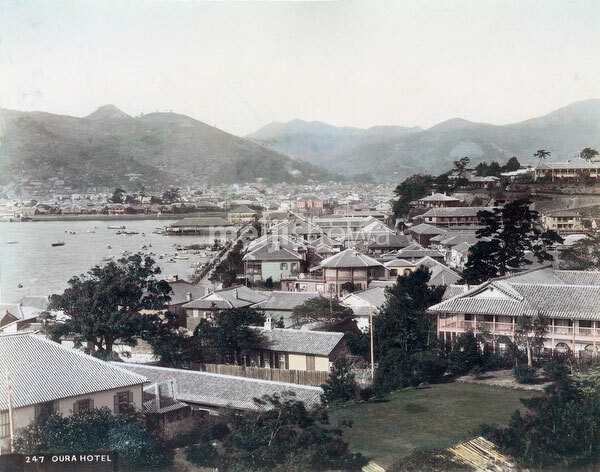 The building on the hill in the far background of the hotel is Russell Hall of Kwassui Gakuin (built in 1876). Part of Dejima Island is visible in the far corner of the harbor. Albumen photograph taken around 1885. See blog entry.